Check our Day 2 here. Check out Day 3 here. Lets talk about clearing out bathrooms today. It's amazing that despite being the smallest rooms in the house, they hold so much and can get so out of control so quickly. So I'm spending a little time purging and creating some new organizational systems in these small spaces today to make sure they function as good as they possibly can! We have four bathrooms in our house - a powder room on the main floor, our master ensuite, the boys bathroom and a bathroom in the basement. Since there is nothing in the basement bathroom except toilet paper and tissues, I only needed to focus on purging and organizing the other three! The main floor powder room is probably the most used bathroom in the house, so I need to keep extra toilet paper etc. there for easy access. 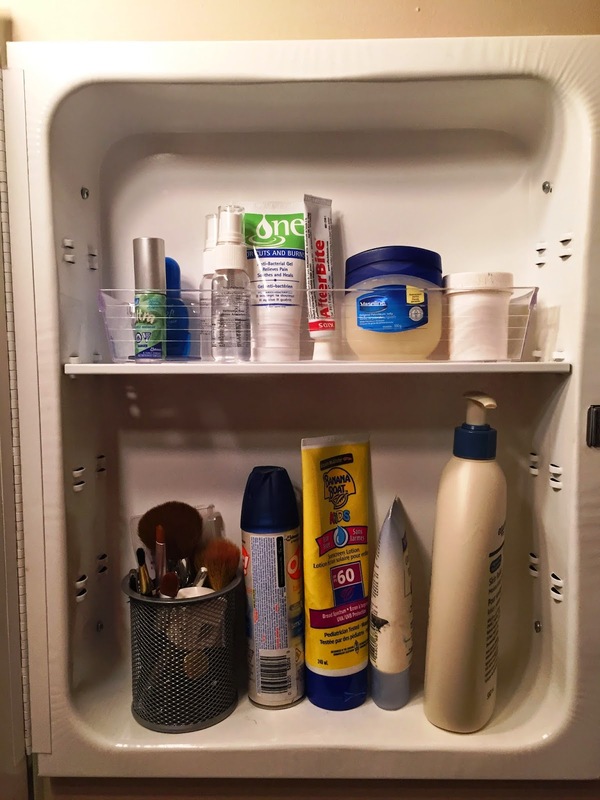 I also do my hair and makeup in there every morning while the boys are eating breakfast and I store sunscreen, bug spray and the first aid kit there as well - a lot happens and need to be stored in this little space! As with any purge and re-organization, I start by pulling everything out, getting rid of what doesn't belong and then placing everything back into a clean space. Under the small 24" vanity I stashed our first aid supplies in a labelled plastic shoebox and stacked a small plastic basket on top to hold hair products, along with extra hand cream and sunscreens. 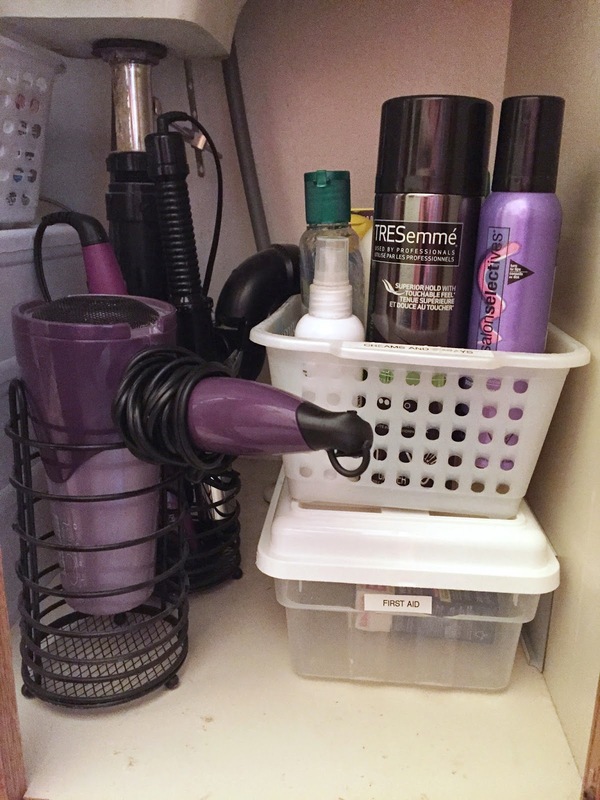 I stored my hair dryer and flat iron standing upright in metal utensil holders from the dollar store, but I think they'll have a tendancy to tip over. I've ordered a great over-the-cabinet-door rack that will replace these holders when it arrives and will free up a bit more space inside the cabinet. On the other side of the cabinet I used a small set of plastic Sterilite drawers that I bought at WalMart. I placed Hair, Makeup and Nail supplies into each drawer and labelled them with my label maker. 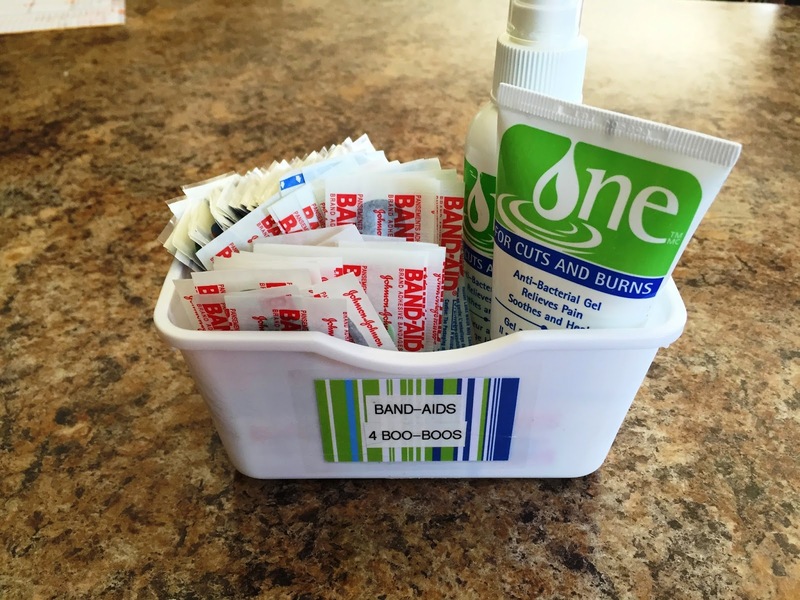 I put another white plastic basket on top to hold extra tissues, wipes and toilet paper for easy access. In this medicine cabinet I keep just a few essentials. 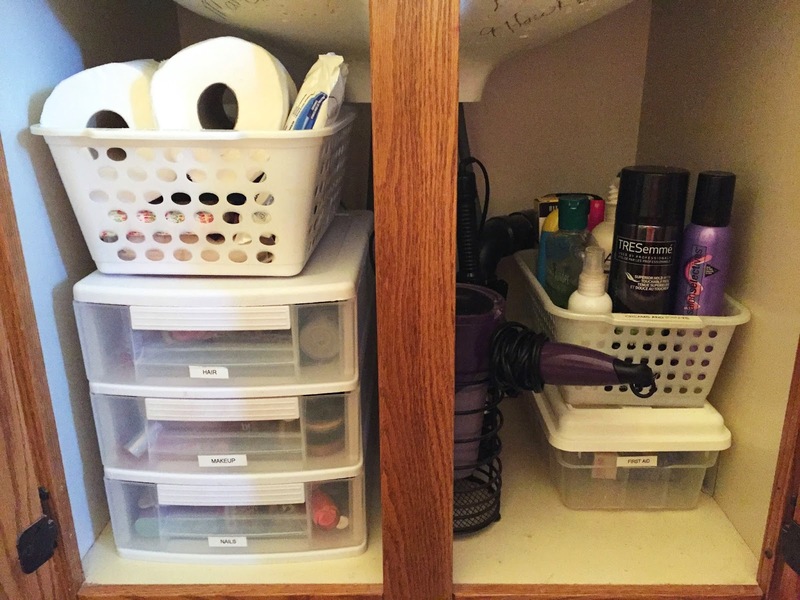 I corralled small items into a long, clear organizer from the dollar store and used a mesh pencil cup for my make-up brushes. Upstairs in the boys bathroom there is a standard wall mounted medicine cabinet and a three door/one drawer vanity cabinet which is 36" wide. Under their sink there is a wall-mounted rack installed by the previous owners (similar here). I purged and then organized it with shampoo, body wash and mouth rinse on the larger lower shelf and vaseline, extra toothpaste and wipes packages. 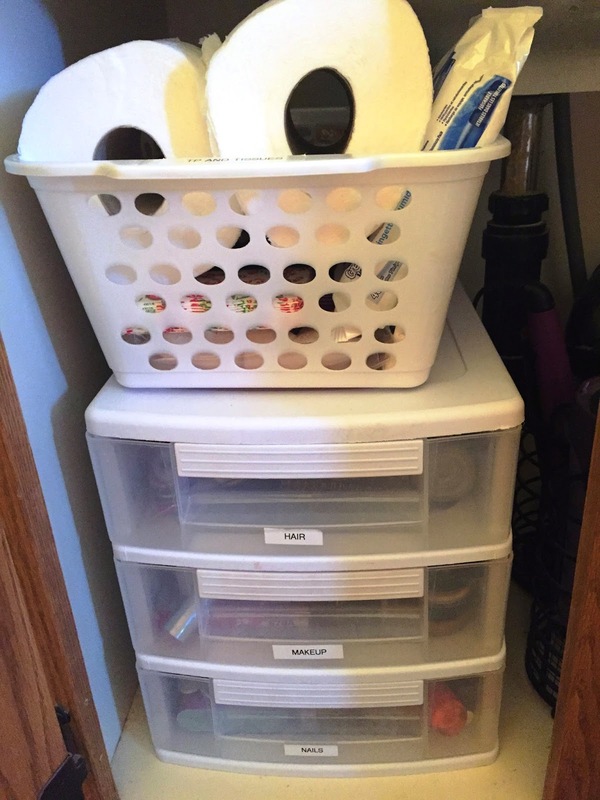 I moved night time "underjams" from the bedroom to under the sink and stored them in a Closetmaid fabric storage cube that had lost its handle - reuse at its finest! A larger dollar store plastic basket stores bath toys, although I don't think we'll have the needs to store these much longer as Sam is losing interest in playing in the bath tub - sigh...my baby is growing up! 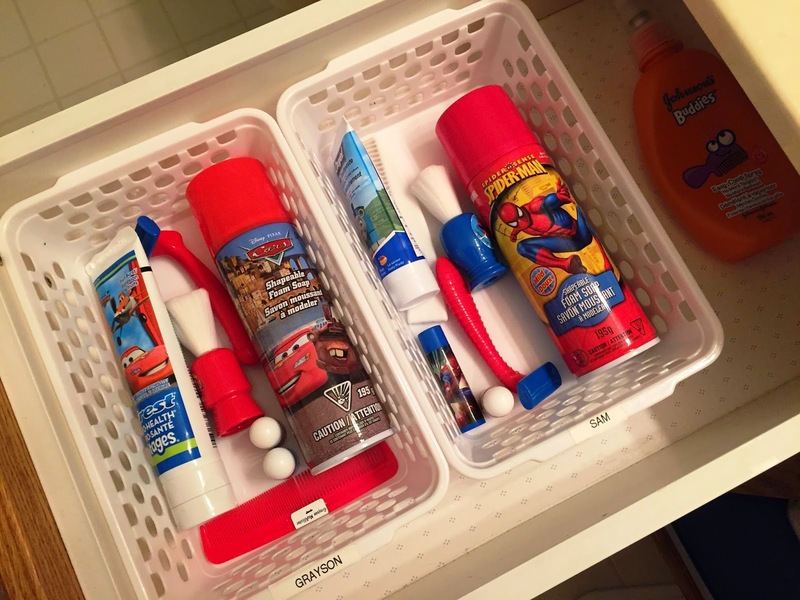 In the tiny single drawer I separated the boys personal items like combs, chapstick and "shaving kits" (hilarious!) into two plastic baskets labelled with their names. I kept the baskets from sliding around by sticking some Blu Tack putty underneath. 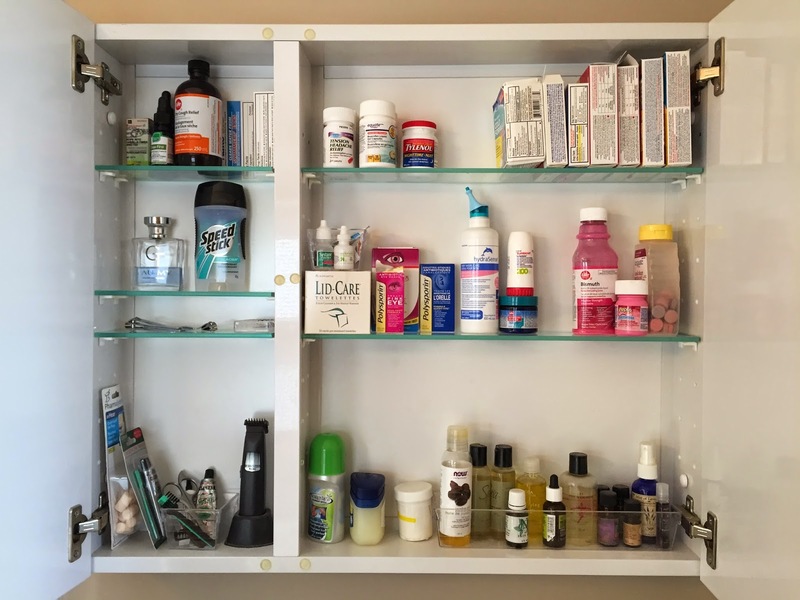 I threw out all the expired medications and then reorganized the medicine cabinet. 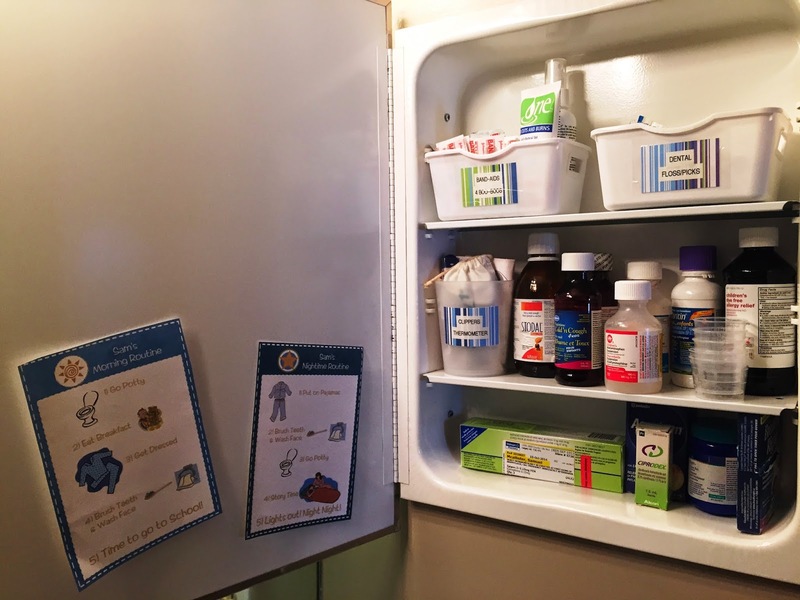 Sam's visual schedule got posted on the inside of the door for easy reference, I labeled some small plastic dollar store bins and a plastic cup to keep things like bandaids, dental floss/picks, nail clippers and thermometers in their place. The labels were SOOOOO simple to make with no need for a laminating machine. 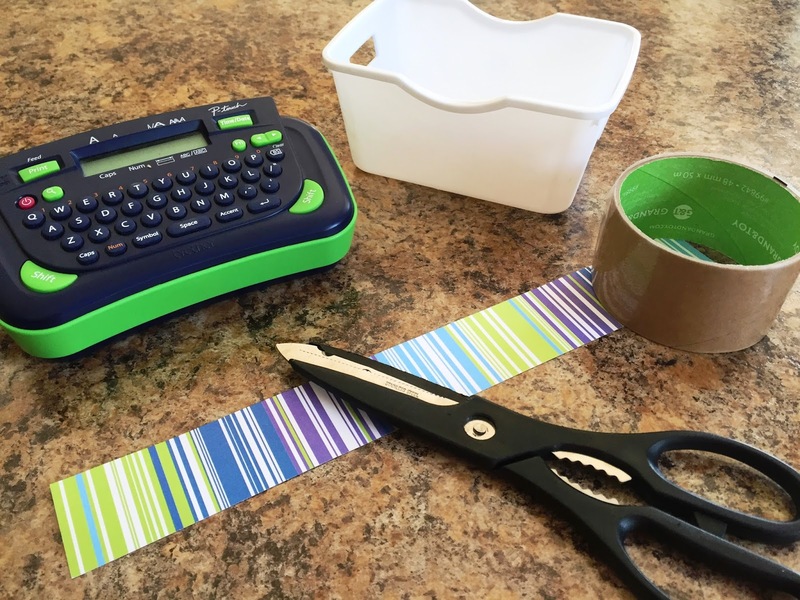 All you'll need is a label maker (or you can handwrite your label on white paper and trim it to size), decorative or scrapbook paper, scissors and clear packing tape. 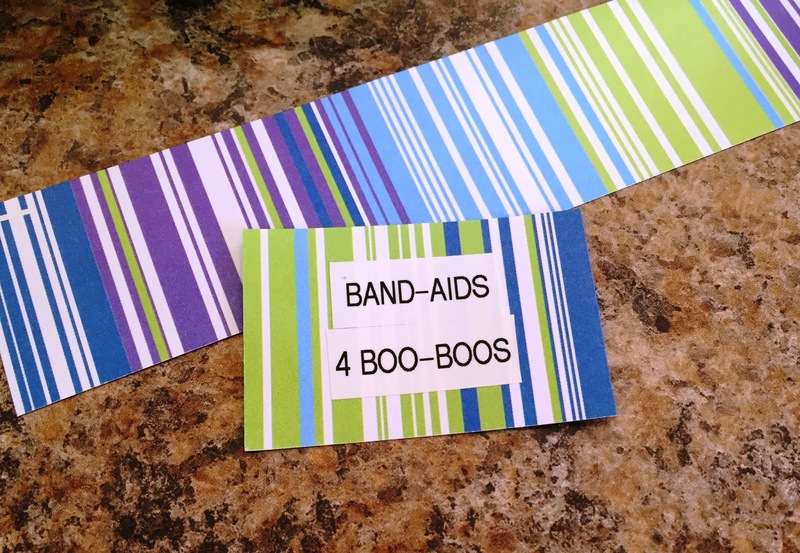 Type or write your label and place it on a piece of paper cut smaller than the packing tape. Then simply use the packing tape to seal and adhere the label to the bin or cup! They look cute and coordinated, are waterproof and can be removed or changed easily later when you change the contents of the container. On to the last bathroom! To call our bathroom a "master ensuite" makes it sound much grander than it is. 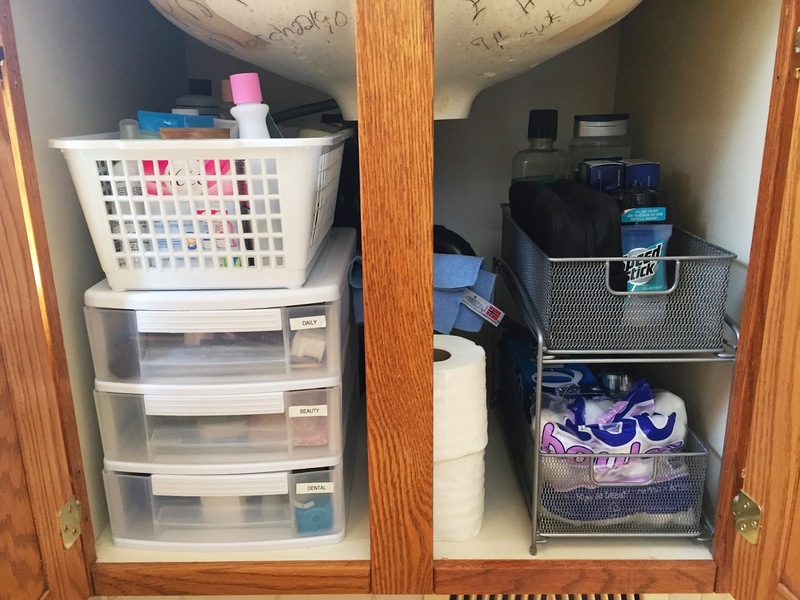 The small 24" two door vanity has no drawer storage so I used another Sterilite drawer and stacked plastic basket system for my own toiletries and a slide out double basket (from Bed, Bath and Beyond - similar here) for Shane's items and spare toiletries. That left just enough space in the middle for a bathroom cleaner & cloth, and a couple extra rolls of TP. Whew! It took a few hours to get all three bathrooms finished, but hopefully it will work a lot better for us. 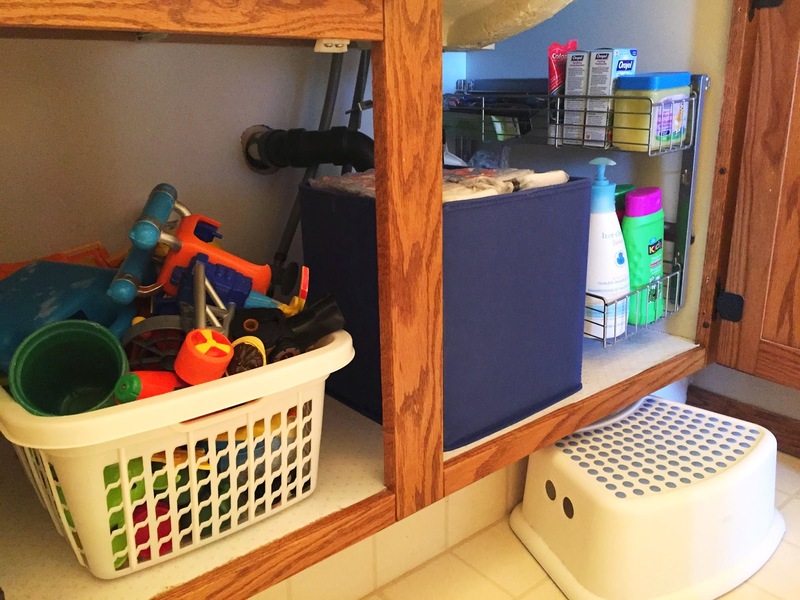 And hopefully some of these ideas will help YOU organize your small bathroom spaces. I did end up with an additional bag of stuff to get rid of today, but this time it was all garbage or recycling. I'm feeling good about purging 5 bags in 5 days!